To those who think this is a dare, it isn’t. The purpose of this expedition is to be able to encounter these creatures in their natural environment, while respecting their territorial habits. Unlike most expeditions which agressively tease the sharks with bait from a boat or from a cage in order to get scary photographs of this apex predator, the photographic and videographic materials which will be taken during this breath-hold diving expedition will show the Great White Sharks the way they are meant to be seen. The happy trio is back in South Africa. William Winram, Fred Buyle and Pierre Frolla arrived in Cape Town late Friday night. 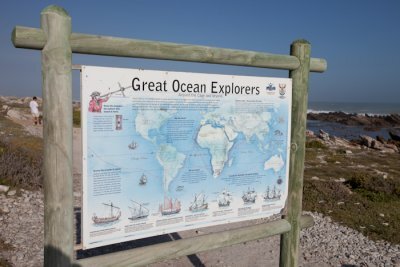 On Saturday, they travelled to Struisbaai, about 27 kilometers East of Cape L’Agulhas, the southermost tip point of Africa. 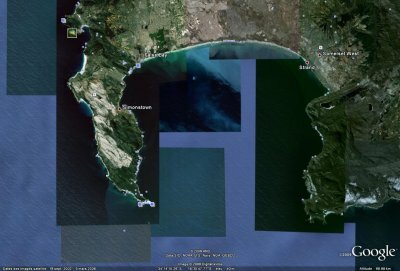 Think about it… this is where the Indian and the Atlantic Oceans meet. Breath-taking scenery, windy and wild. 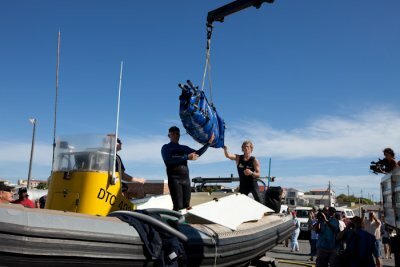 Yves Lefèvre has now arrived in Struisbaai, ready to witness and capture on film the great white shark encounters with the breath-hold divers. Unfortunately, the Eastern winds have gotten stronger (30 knots) since yesterday with gale-force gusts to 35 knots. Not safe to get out to sea. Not to despair, this setback is the perfect opportunity to hike along the coast towards Arniston. William says: “the wind was howling, pelting us with sand and salt”. 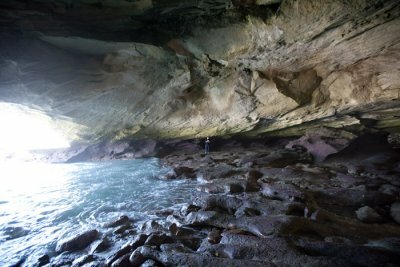 They took refuge in local caves which are only accessible during low tides. This morning, with winds down to 8-10 knots and a calm-looking ocean, William, Fred and Pierre, along with the rest of the crew prepared for their first day in the water. With Captain Steve Benjamin at the helm, they headed out to sea. After an 8-kilometer boat ride off the coast, the hopeful mood was gradually replaced by disappointment when a thick fog decided to join in. If that was not enough, water visibility was poor (2 meters) and the seas were churning like a washing machine. They had to turn back as to have gone further would have been too precarious. Better luck tomorrow. Cross your fingers. Sharks – Sharks – Sharks. That is the Mantra William Winram, Fred Buyle and Pierre Frolla are now repeating daily. Today was a repeat of yesterday. No sharks in sight and a rough boat ride. 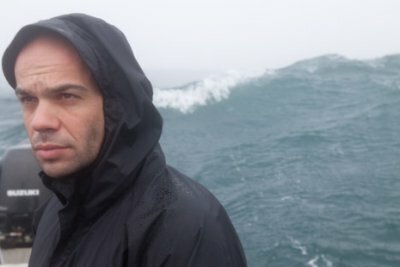 A lot of time was actually spent in the boat because a swell started to build. But, not to despair. The dive center manager says the weather forecast will bring clearer waters on Friday and Saturday, and sharks by the same token. One can only hope. High winds and rough seas. Time to nurse those sunburns and hike more around the area. After an early rise and a long truck ride, it’s 5:45am when the boat is finally launched in the waters of False Bay from the harbour town of Gordon’s Bay. Our gentlemen traveled 200 kilometres of water. They did indeed see tuna, skip jack tuna. These creatures are too quick to catch on film. A blue shark answered the bait call and stuck around for quite a while, nonchalantly. Then, there was a massive old male sperm whale, which would dive down every time William, Fred or Pierre wanted to get in the water to dive with him. Talk about shy !!! Visibility was not always good, sometimes as little as 1 meter. Seal Island. Rich, diverse and beautiful sea life: anemones and abalone galore. Large colonies of seals and sea lions basking in the sun. A seal pup swam up to William. First, she wanted to bite the camera, then she got him to rub her under the chin, then she tried to bite his mask and then his fins. These were curious bites, not aggressive. William found himself caught in the middle of a large group of females, of the sea lion kind this time. No time to be coy. 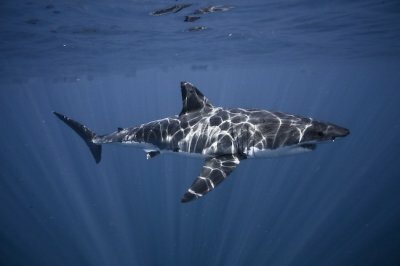 At the end of the day, many stunning images, but still no Great White Sharks. Where are they? Today was a 17-hour day. 5-hour car ride and the rest of the time was spent on and in the water. Any takers? Tomorrow will be the last day of diving for this expedition. Today, 6am saw the launch of the boat for the last time for this expedition. 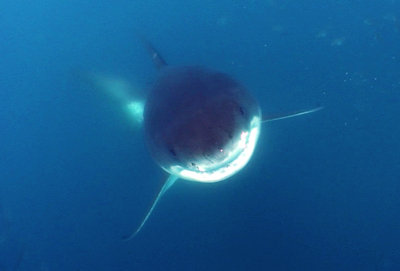 Determined to see and dive with a great white shark, William, Fred and Pierre’s hope declined after each hour passed. After a long day of poor visibility and no sharks in sight, around 3:30pm they were almost ready to go back to shore when THEY finally came. They, meaning a male and a female great white sharks, 4-meter and 3-meter respectively. Our gentlemen first spotted them from the boat, so they quickly but quietly went back in the water. Visibility was still poor but sufficient to see and interact with these creatures. In the snap shot from film footage on the right, the male great white shark came at William, curious, and then passed him by. Fred, Pierre and William spent half an hour swimming with the animal which demonstrated very calm and rather timid behaviour. It was obvious from the short phone conversation which ensued that words are unable to convey the depth of this “in the nick of time” experience of a lifetime. Back on shore, the freedivers rushed back to the house to pack their luggage and grab a quick bite to eat. Soon it would be time to arrive at the airport… their flight was at midnight. Still images and film footage will follow. However, we have been informed not to expect the same kind of photos and film quality as last year’s expedition with the tiger sharks, because of the lesser visibility. See for yourself.